Tiny Tips for Library Fun: Happy 50th Anniversary CCBC! I've always consdered myself one lucky duck to work in the same state as the Cooperative Children's Book Center (CCBC) in Madison. This book examination center headed by K.T. Horning and womaned by an amazing staff that includes Megan Schliesman, Merri Lindgren and Emily Townsend (as well as a stellar universe of former librarians who continue to shine out wherever they are employed - and hats off to Ginny Moore Kruse for her work in developing the CCBC into a national as well as state force) has been a touchstone throughout my career. There have been a number of celebrations this year around their 50th anniversary, including a recent one at the Friends of the CCBC annual meeting. I was thrilled to be asked to be part of a panel presenting on ways in which the panelists used the CCBC resources in their work. Our panel was comprised of a research university prof; an author/historian researcher; a university prof/researcher/writer...and me! Here are my actual notes for the talk I gave. Lots of laughter when I showed the audience what I was speaking from. The catalog card is significant for many reasons not least of which the CCBC has meant so much to me and my practice of youth librarianship that I only need a hint to share the good stuff. Library School Student - the CCBC was just a hallway down from SLIS. As a youth focused SLIS student I could access the newest books and get to know the breadth of children's literature and research on it with the best reference desk. I got strong. Collection Development - the CCBC was a must-go early in my career as I honed my collection development chops. I would bring down stacks of old catalog cards with titles jotted on the blank side to look at and decide if we REALLY needed that particular title. And I found great unreviewed material like books in the incredible Small Press Collection to add to the collection. I could go back to my director with a stack of cards of what we didn't buy because I actually had the book in hand. He made the connection, and always funded these quarterly, 8-9 hour round trips to Madison. Colleague Connector - the CCBC was the unsuspecting facilitator of some of my strongest connections with school colleagues. My favorite connection happened with Judy, our district reading coordianator. 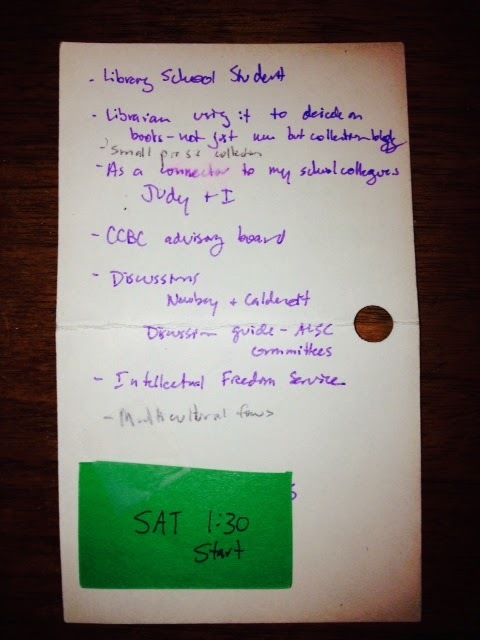 An invite to experience the CCBC with me and spend those 3 hours commuting resulted in big ideas and a lasting connection that informed our amazing partnership work for twenty years between the library and schools. CCBC Advisory Board - I served on the board twice and I learned even more about the resources and the many ways both school and public libraries accessed the collections and information. It helped me hone my leadership skills as well! Book Discussions - the time I spent participating in the monthly book discussions taught me how to truly learn the art of careful listening and powerful advocacy for books. National level book award committees use the CCBC Discussion Guidelines for a reason. They work! Eveything I am as a reviewer for SLJ and in my award committee discussion work I owe to the CCBC and that modeling and training and experience. Intellectual Freedom Service - not many people outside of our state know, but for decades the CCBC has helped WI librarians navigate book challenges by providing, in complete confidentiality, reviews and other support materials to help answer a challenge. Ably run for the past twelve years by this year's WLA/WEMTA Intellectual Freedom Award winner Megan Schliesman, this service has helped me twice in my career. And I appreciate it. Multicultural Focus - The CCBC , with its annual CCBC Choices publication and long-running observations and discussions of muticultural issues in publishing, has helped me hugely in creating a collection that reflects our world. Conferences, speakers, authors and illustrators have been brought to me as well through their work in this area. They helped me develop a strong collection early on. I was honored to be asked to represent a working librarian's perspective on the panel (and I tell you humbled by the company I was keeping!). Congratulations to the CCBC on their 50th and many, many more great years to you!